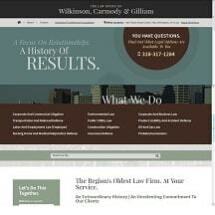 Wilkinson, Carmody & Gilliam is the oldest law firm in the region, tracing its origin to January 1, 1895, when a partnership was formed by John Dallas Wilkinson and A.T. Alexander. For over one hundred years the firm has maintained a broad civil and corporate practice, including the representation of utility, railway, financial institutions and other corporate, individual and insurance clients with state and national interests. Its lawyers practice in a wide variety of federal, state and local law matters with an emphasis on litigation. It is proud of the legal abilities and personal qualities of its attorneys who, among past and present members, include a former president of the Louisiana Association of Defense Counsel, an Associate Justice of the Louisiana Supreme Court, a Mayor of Shreveport, a member of the Louisiana House of Representatives, a founder of the Federal Power Bar Association and chairman of the governing boards of several educational institutions.